Parking is possible on two above-ground floors of the parking building at the reserved, non-guarded car park (GPS Loc: 50°1'15.63"N,14°27'49.75"E) near the Residence EMMY Hotel. 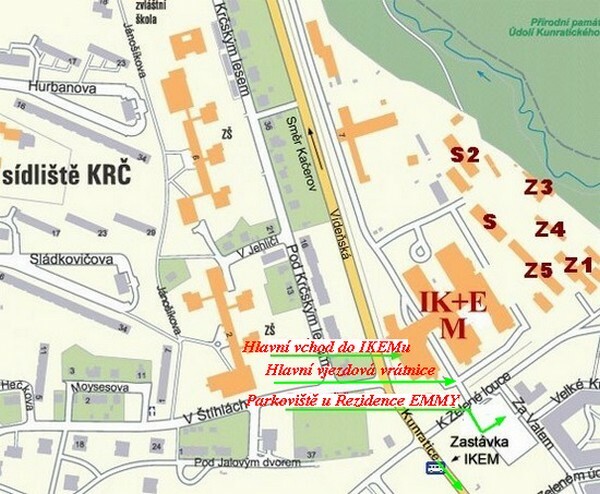 The car park is situated right at the access road (K Zelené louce Street) – opposite the main entrance gate of the IKEM premises. The parking fee is CZK 30 for every commenced hour. The car park for visitors and IKEM patients is situated about 100 m from the main entrance to the IKEM building. The car park capacity is approx. 200 spaces.